I stumbled across a store in Bethesda, MD called Secolari Artisan Oils & Vinegars a few weeks ago. They have an incredible assortment of Olive Oils, Vinegars, and Pastas many with unique flavor combinations. I tasted through most everything in the store and found several things I liked, including a vinegar called Pacific Spice. It is sweet and spicy with a very unique flavor. The tag in the store says it contains Kiwi and Chili Pepper with Ginger, Citrus and “Secret Spices”. I used it mixed with some Greek Olive Oil to dress some Arugula and it was very good, but I thought it had potential as an ingredient in a dish. 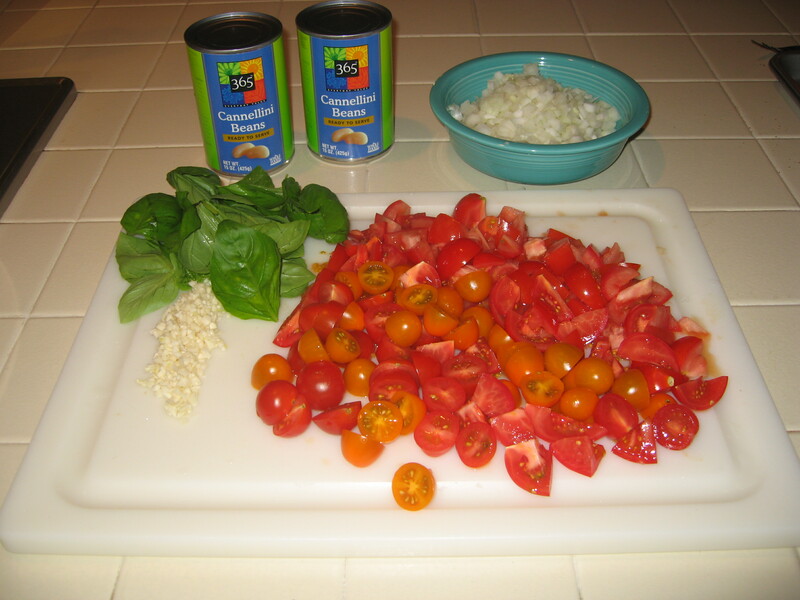 In a large, oven-proof pan, I added the Olive Oil and set the heat to medium-high. 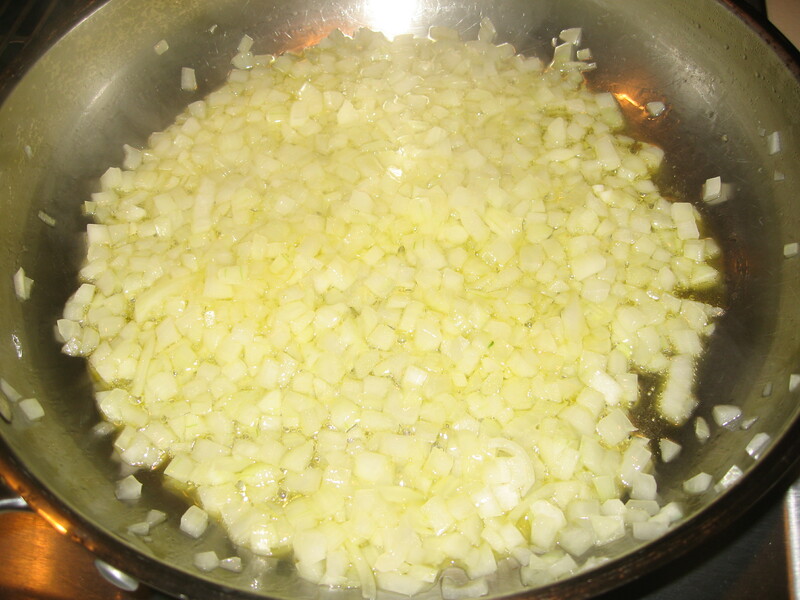 When the oil was hot, I added the onions and cooked, stirring frequently until they were translucent. Next I added the garlic and cooked it, stirring to keep it from burning for about 3 minutes. 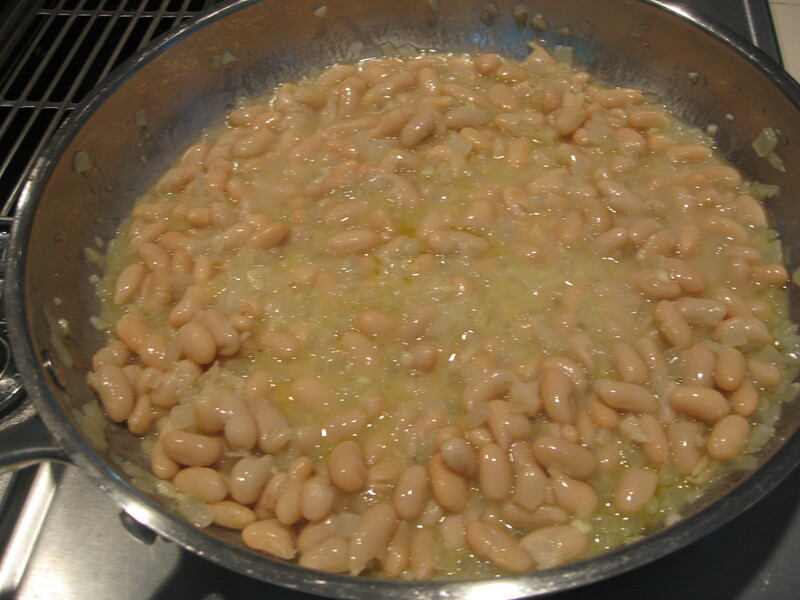 I added the Cannellini Beans and mixed them together with the onions and garlic. I heated this mixture for about 5 minutes to cook off some of the bean liquid. 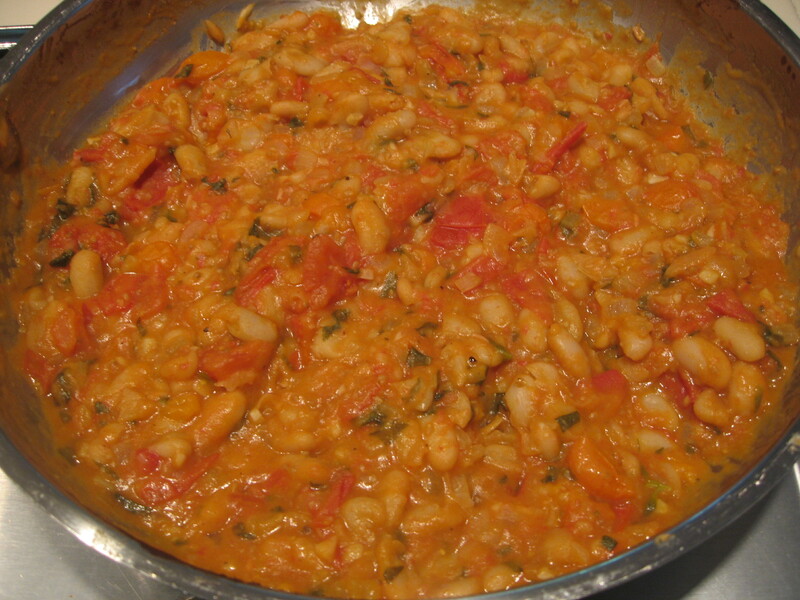 Next I added the Tomatoes and mixed them gently into the bean mixture. I let that cook down for about 3 minutes, then added the Basil leaves. I heated this mixture for another 3 minutes, then added 2 Tablespoons of the Pacific Spice Vinegar. I pulled the pan off of the burner and put it into a preheated oven set at 400 degrees. I left the pan in the over for about 6 minutes or until the mixture dried out a little, then removed it from the oven (careful it will be hot). I poured in the remaining 2 Tablespoons of vinegar and stirred it in. I let the mixture sit for a good 5 minutes before transferring it to a bowl. 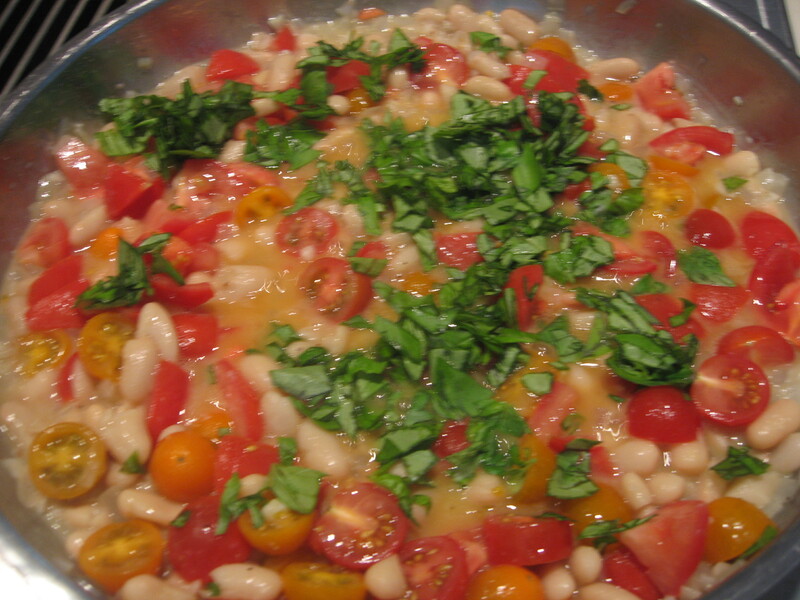 This normal bean and tomato mixture really came to life with the vinegar. It had a little heat, it had a little sweetness and it was just really good. We ate every drop of it. And it was really good with a simple grilled rockfish filet. Since you may not find Pacific Spice Vinegar unless you live in Maryland, you might try Tarragon Vinegar, it seems like it would be a good substitute. Give it a try and let me know what you think.